Some of the many messages we have received from our customers. If you’ve never been there, or thought about it much, Hungary is likely to be a bit a surprise. Firstly, it’s flat – very flat. Think of the Fens on a national scale, then take away the cabbages and potatoes, and you might be close. But then think of the Fens in the grip of a heatwave previously unknown in Cambridgeshire/Lincolnshire and you might get closer. We’re talking about temperatures of 38 degrees, and around 90% humidity, which was unremitting for the duration of the WBC 20-strong Away Team’s visit to the beautiful city of Eger and its surroundings. Hungary is landlocked, so it’s no use looking for a cooling sea breeze – or any breeze at all at this particular time. What respite there was came in the form of visits to woodland sites around the Bukk Hills early in the morning searching – successfully – for woodpeckers. Most of the time however, we were out on the plains, or on the tracks between the wetlands in the Hortobagy National Park, where shade was hard to find. Thank you so much for a wonderful week’s holiday and your care in helping us all to have the best experience possible. Thank you Deana for driving me and the other guests to and from the airport. It was very reassuring to meet you after my first solo flight, and to have a safe transfer to and from the hotel. Kate - UK Thanks for the most brilliant week's birding. My expectations were totally exceeded. Graeme from Aberdeen - March 2016. 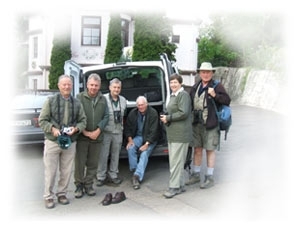 Firstly a really big thank you for that super days birding in the Bukk hills. It was a fantastic day and one that will stay with me for years. I just would like to thank you for such a brilliant holiday last weekend. I was really pleased at the number of birds we were able to see and the range of habitats; Hungary is such a varied country. Especially excited to see The Great Bustard, Golden Oriole and Ural Owl. We had a superb week with you. Every day proved to be most interesting and with exciting moments. We had such excellent views (and sounds). You made it possible and thank you for everything. I particularly appreciated the trouble you took to make the holiday so interesting. Antony & Geraldine from Kent. Frequent Visitor Eleanor Hurley supplied us with this account of her last trip. Many thanks to her. 12th May - We left Edinburgh on a 6am flight by KLM to Amsterdam then an onward flight by Malev to Budapest arriving at 3pm. Our guide Roy and our driver Laslo with a minibus and car met us. The drive to our hotel in Eger The Villa Volgy took about 1 ¾ hours. After checking in at reception we went for a walk round the hotel before dinner.